This hobby does many good things for me. It’s a channel for creative expression, an entre into new fields of learning, a doorway to social settings. But a means of relaxation? Um, not really. I can be a terrible perfectionist at times. Take this Model Power Erie Station kit, for example. I picked it up at the Batavia show a couple of years ago for $7. The box was heavily water-damaged, but all the pieces were there, still on the sprues. When I decided that the yard modules needed a structure or two, this kit seemed like just the thing. I promised myself I wouldn’t get uptight about the assembly. Yeah, right. Model Power’s so-called “Erie Station” is actually a model of the Rio Grande Southern railroad station in Rico, Colorado. 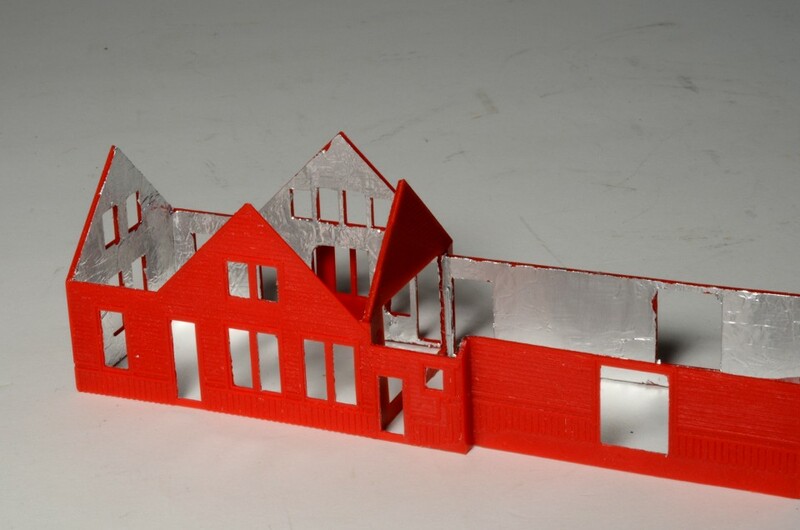 Models of this particular building have been available in N, HO, O, and probably other scales, for many years. It just might be the most-modelled railroad building ever. The Model Power kit comes molded in four colors, so you can assemble it right out of the box and plunk it on the layout. Well, maybe you can. I sure can’t. Those bright red plastic walls are just too garish for my taste, and if my past experience with Model Power buildings is any guide, they’d give off a translucent glow from any interior lighting, too. So, opacity was the first thing to deal with. With past projects, I’ve addressed the glowing-structure problem by painting interior walls black, or lining them with black paper, with some success. For this building I laminated the walls with pieces of aluminum foil, sprayed with a light hit of Super 77 adhesive. After the adhesive had some time to set, I cut out the door and window openings with an X-Acto blade. Yes, it was tedious. Yes, it was probably overkill. But I’m pretty sure that no light is going to bleed through these walls. The next issue for me to worry about was the cupola. In most aspects, the Rico station is a perfectly typical late-nineteenth-century railroad station, such as you’d find in any corner of the country. The tiny cupola, sitting awkwardly on one side of the track-facing dormer, is anything but typical, however. I don’t want people recognizing my station as “that kit I’ve seen a hundred times before.” I just want a typical station. The cupola absolutely had to go. It’s easy enough to leave it off, but it leaves a blank, unshingled patch of roof behind. I laid down thin strips of styrene to cover the bald spot, and carved them as best I could to match the cedar-shake-style shingles molded into the rest of the roof. Obsessive? Probably. With the major modifications out of the way, it was time to fret about paint. An “Erie Station” ought to be painted in Erie colors, right? Why not? The Erie Lackawanna is one of the railroads that inspire my modelling. A quick flip through my library yielded a good color photo of the Erie station in Avon, New York, in the Erie’s standard two-tone green. Out came the airbrush. The entire station got a hit of light green, then using the photo as a reference, the lower half got the dark green. I just used a loose mask for the boundary, and for once, didn’t worry too much if it wasn’t perfect. There would be some touch-up done later anyway. 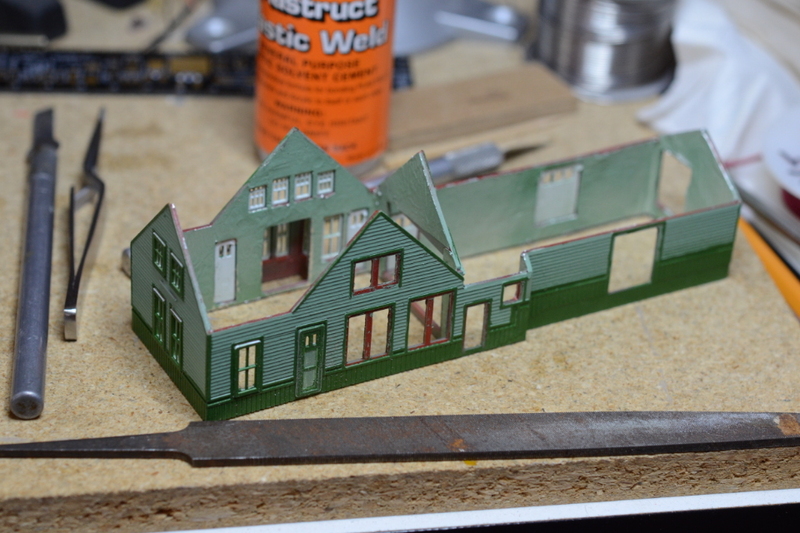 While I had the dark green in the airbrush, I hit the windows and doors attached to the sprue. Most of them, anyway. I somehow missed a couple of doors. The base/platform and the roof each got its own shade of dull brown. 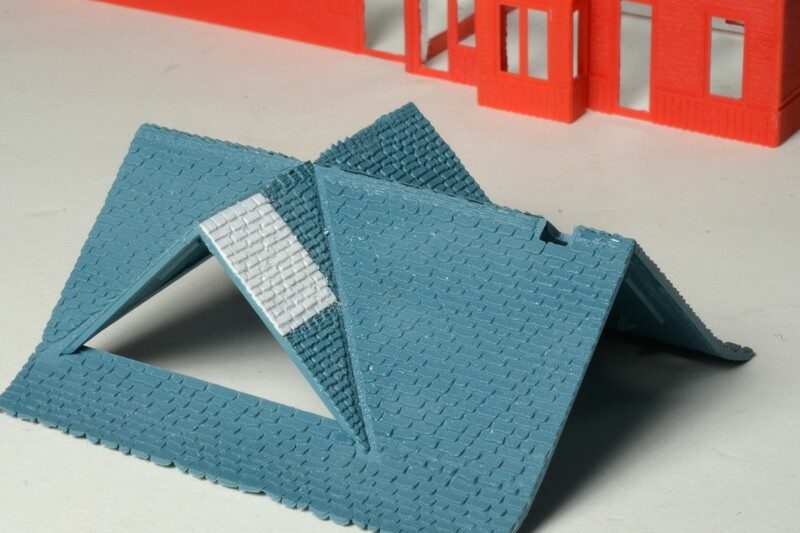 (That slate-blue color looks great on kitchen accessories, but silly on roofing shingles.) After the airbrushing was done, and everything had had a few days to dry, I painted trim by hand, and did a little touchup. Windows and doors started going on next, a few at a time. They install from the outside, which meant that some paint needed to be scraped away first for the glue to adhere properly. The fit on some of them turned out to be a little sloppy, so I had to take care to align them reasonably well before the solvent set up. There’s a tiny dormer on the back side of the roof; its fit needed adjustment, too. After that, another round of touch-up with a 000 paintbrush. While doing this Saturday morning, I let a perfectly good cup of hot coffee go cold. I still have a ways to go yet before this station is ready to go on the module. It’s not perfect, but I like the way it’s coming along. Maybe I should start relaxing now. Posted in Structures and tagged Model Power, N scale, Rico station on August 6, 2016 by Jeff Faust.